T-Shirts now available! Sign of successful capitalist media saturation or total, utter irrelevance? You be the judge! It is time to acknowledge the smelly, drum-beating elephant in the room. On its non-music side, this blog hasn't generally shied away from looking at New York-centric political topics, and I'm very aware that its lack of any discussion at all of Occupy Wall Street sticks out like a sore thumb as a result. Honestly, I'd been holding off until I formed a real opinion of the protests; at this point, it's nearly two months into the thing, and I still haven't shored up my thoughts on it. Since that's not likely to change, let us instead spend a few minutes taking in the cognitive dissonance of it all, in a nice, well-organized list format. * Regardless of anyone's personal opinion of OWS, it has a right to exist. A constitutional one, actually: the right of the people peaceably to assemble, and to petition the Government for a redress of grievances is a phrase that should at least ring a bell for most Americans. Mayor Bloomberg needs to cease the vague threats and generator confiscation. It's hardly surprising that he seems threatened by OWS; in the parlance of the thing, he is certainly the 1%, and it is his old buddies that are being targeted by the protest. His instinct to protect them is either laudable or despicable, depending on your perspective. My vote is for "both"; sorry folks, but the world is a confusing place like that sometimes. * There is no doubt in my mind that there are sincere people camping out at Zuccotti Park. Hard-working, well-intentioned people who are simply at the end of their rope with being un-/under-employed through no real fault of their own have every right to be angry, and good on them for taking it public rather than sobbing in their pillows. I'm job-searching myself at the moment. I'm not a dumb guy. I'm not afraid of hard work, I have plenty of experience with a lot of different things, and I am a fast and eager learner. I'm also over-qualified for Nathan's, and under-qualified for the great, lofty corporate boardrooms. There are times where I end my job search for the day with the thought that I'm only a severe distaste for camping out and the smell of Patchouli away from grabbing a tent of my own and hangin' downtown for a while. Bear in mind that I'm a guy whose feelings on groups and movements are much more Groucho Marx than Woodstock '69. People - myself very much included - are frustrated and angry with where America's economic drift has landed them, and they are right to be. * There is no doubt in my mind that there are plenty of jackasses who consider protest a viable alternative to productivity camping out at Zuccotti Park. Hard to avoid it, sadly: wherever there is protest, particularly a high-profile one, there will be a squadron of dorks who never miss the opportunity to stick it to the man, man and show up to protest whatever, thusly avoid doing anything that might actually help push us as a people towards a different, brighter future. You know the type: moccasins/sandals, hackey-sack, really into the Dave Matthews Band and hemp. The media will always fixate on these cretins, because it is far easier to present a cartoon than it is to deal with anything of substance. All others involved would be better served if these types would simply dry up and find somewhere else to crash, but it ain't gonna happen in this lifetime, unfortunately. 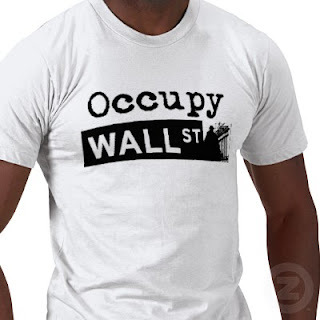 * Sorry fellow progressives, but anarchy just doesn't work, and OWS is the ultimate proof. We are approaching the two month mark of the protest, and one of the most commonly cited responses to it is "what, exactly, is their goal?" That is a major failure for such a high-profile movement; it is unquestionably a major squandering of potential. The reason given for the lack of stated objectives generally goes something like this: "We don't have a leader! We are a group of diverse people, each with our own views and feelings!" That's great, but then what's the point, exactly? Learn your history, folks: all successful revolutions, not to mention successful corporations, involve an articulate, charismatic, driven leader - and you, OWS, will need one too if you are really interested in actualizing the tremendous potential lying stagnant in your ranks. The question, then: are you? Or is this just a bunch pseudo-anarchist hot air? * No matter what its follies and failures, OWS must be addressed with substance by any serious 2012 presidential candidate. This is true of all of them, regardless of party affiliation or ideology, but it is truest of Barack Obama. Mr. President: forget for a moment about the cartoonish "professional protesters" and listen to the good, honest people I spoke of above. These are the people who voted for you. They are the people who believed in your promises of change and reform. These same people now have a message for you that could not be clearer: they no longer believe that you have the drive, desire or ability to enact economic reform in a meaningful way. You must address them, and you must do so forcefully for a change, through actions rather than rhetoric. Or, to put it in business terms, these are seriously disgruntled customers, and yours is about to no longer be the only line of products available.